What’s a library stamp? I’m glad you asked! It is literally a stamp that someone can put in the front of one of their books to clearly show (with pride), that said book belongs to them. If you type “personalized library stamp” into Etsy you will see what I mean. There are many options to choose from, and giving it a personal flair will make it even better. Although, I’d check to make sure your bookish pal is alright with stamping the inside of their books. Some prefer them to stay in pristine condition, and there is nothing wrong with that! I have a few sweaters and t-shirts with book covers on them, and am constantly being asked where I got them from. Behold, one of my favourite online stores: Out of Print. When I first started shopping here they only had tops, but now there are also socks, enamel pins, mugs, and more! There is something for everyone, and I promise, getting a book nerd some apparel with their favourite cover on it will not disappoint. Almost every bookworm I know loves curling up with a cup of tea when they read. It just makes everything extra cozy. While most people will stick with their go-to green and black teas, I promise you, any reader will be over-the-moon if they were gifted a literary-inspired blend. I’ve tried a few teas from FirstEditionTeaCo, and as someone who typically doesn’t drink tea, I hope you believe me when I say these ones are tasty. I don’t know why I love reading socks from Chapters so much, but I do. Part of me thinks they are silly—they are just big, warm socks—but another part of me thinks they are so cozy and fun. I’ve been gifted three pairs of these, and the excitement hasn’t worn off yet. The only thing better than a pile of new books is a beautiful picture of books, right? Don’t believe me? Then take a look at the prints from Ideal Bookshelf! One of these prints would make a lovely addition to a home library. Plus, you can make custom orders to show off a reader’s favourite books! They also have mugs and tote bags, too. Who doesn’t like lighting a candle while they’re hanging out at home? If you don’t have an old-fashioned fireplace, this is the next best thing. And you know what makes it better? Taking in the scent of a book! I always see people on Instagram posting photos of bookish candles, and the jealously is real. After some research, I stumbled across Frostbeard Studio, and they seem to have it all. These soy-based candles have scents from old books to rainy day reads, Sherlock’s study, the Divination classroom, and more! One of their seasonal scents is “Christmas at the Burrow,” and if you even try to tell me you don’t want to pretend to be celebrating with the Weasley gang, I’m going to call you a liar. 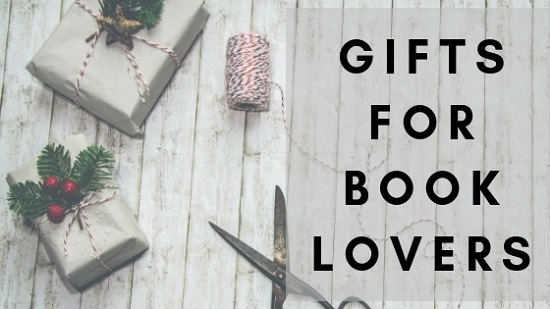 If you want to give the gift that just keeps giving, consider a book box subscription. I’ve bought quite a few of these over the past few years, and love them so much. Each month, you’re sent a box that contains a book, and typically 2–3 items (or more) that either relate to the specific book, or reading/literature in general. Book boxes are always full of wonderful surprises. If you’re shopping for a Canadian, I’d check out Sweet Reads Box. They are one of the few Canadian options, and always sell out. I personally haven’t received one, but they always look great. If you’re shopping for an American, I’d take a look at Shelflove Reads. They focus on YA books, but include items specifically for adults.